If you are not an expert in writing code, this Master Class will show you how to use the Fluid Player Builder, which allows you to edit some of its key features and automatically generate the code you need to add it to your website. As you can see The Builder works as a series of field boxes and tick boxes, with each box representing an editable feature. 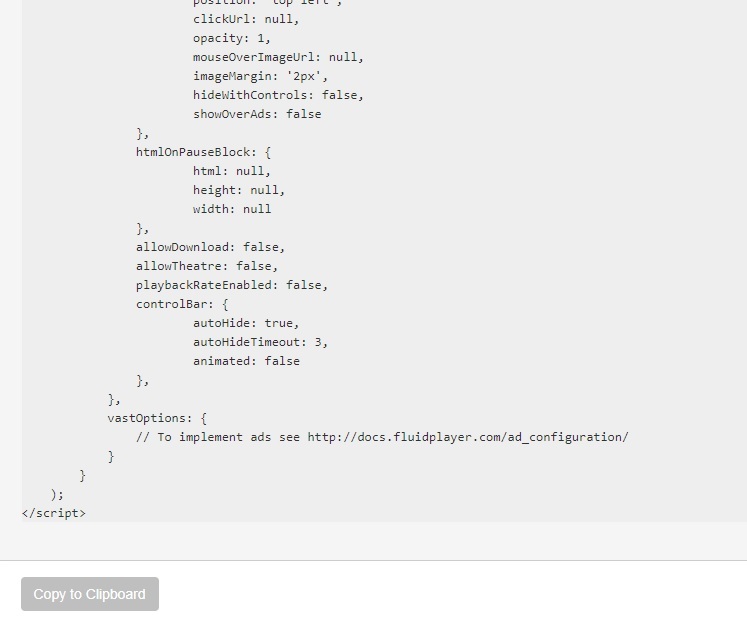 You can find The Builder in the Documentation section of the Fluid Player website. Changing this parameter will change all the above areas to the color specified. You can match the color to your site or choose a contrasting color. You can generate the code for HTML colours using this tool . Poster Image : This field allows you to set the path to show an image before the video plays. This could be a custom thumbnail, your websites logo, in fact any image that you wish to show. By default no image will be shown, until you add the path to an image you would like to use. Fill Container Div : If this field is enabled the video player will take up the size of the “Div” or section where you want your player to be embedded. Tick this box to enable this feature. Keyboard controls : This feature allows the user to use their keyboard to control Fluid Player. If you wish to disable these options check the Keyboard Controls box. Play/Pause animation : If enabled animation fades out the play/pause button. Show button : Enabled by default, Play/Pause button will appear when the page is loaded. Show control bar : If enabled, video control bar will appear when the page is loaded. After X second(s) Animate : This enables a fade out of the control bar, if it is not ticked it will not fade out but disappear. Download : If enabled, users will be able to download the video being shown in Fluid Player. Theatre mode : If enabled, theatre mode alters the size of the player, showing a full screen width and 60% screen height player instead. Playback speed : If enabled this will allow the user to change the playback rate/speed of the video. On pause HTML : This feature allows you to display an in-video banner ad using an iframe code in the centre of Fluid Player when a user pauses the video. Add your code inside the field. Note that scripts won’t work. So once you have chosen your parameters for all the sections, the code will be generated in the field box below the Builder, simply click the 'Copy to Clipboard' button and add the code to your website. Easy! 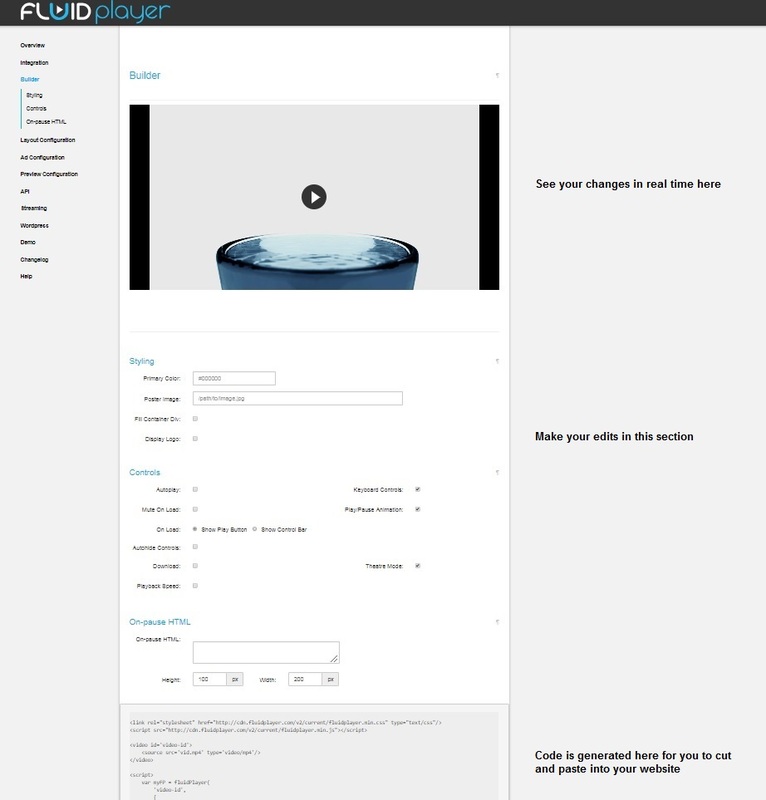 As you can see it’s a pretty cool tool and makes it super easy for you to integrate Fluid Player into your website. And if you want to carry out some deeper editing visit the documentation page on Fluid Players website for code examples of more features.